Solid Line Design launches the REYAP Website, kicking-off the start of their online communications. 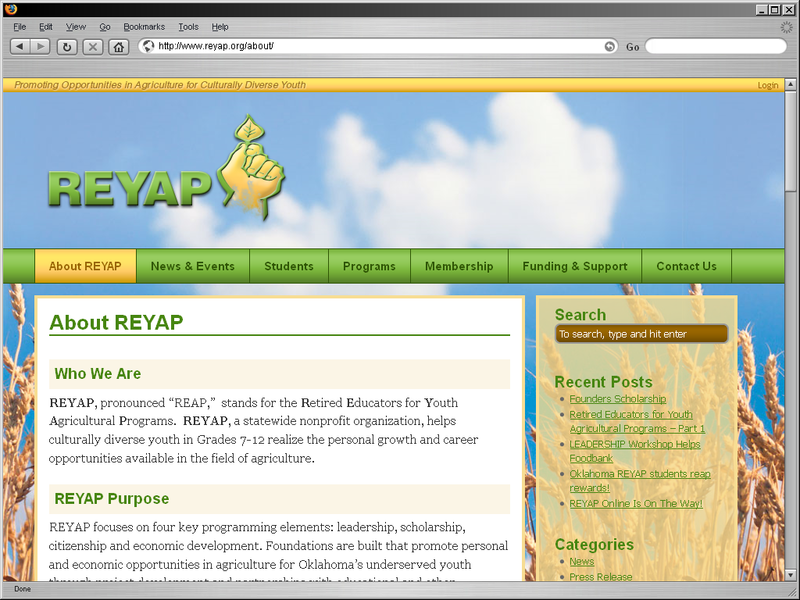 REYAP, pronounced “REAP,” stands for the Retired Educators for Youth Agricultural Programs. REYAP, a statewide nonprofit organization, helps culturally diverse youth in Grades 7-12 realize the personal growth and career opportunities available in the field of agriculture. Making information easily available on the web to existing and potential students was a primary objective. REYAP’s opportunity to expose students to the multitude of Agricultural careers, which in today’s tech-focused world might otherwise be overlooked, is invaluable. It may be where that student finds his or hers niche in life. Solid Line Design created their basic online content management system, updated their branding (showcased on their new site), and provided their staff with training so they are not only on the World Wide Web, but have the power to manage their message and content from anywhere with internet access. This entry was posted in Clients, Website. Bookmark the permalink. Both comments and trackbacks are currently closed.